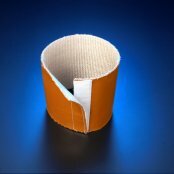 Firesleeve with VELCRO® Brand Hook & Loop is the perfect choice for protecting hydraulic hoses and lines, pneumatic lines, fuel & oil lines, brake lines, wires and cables from exposure to high and extreme heat conditions. The extra thick special formulation of silicone rubber sheds molten metals, slag, welding splatter, electrical or grinding sparks and contamination. Firesleeve also provides protection from ozone, UV and abrasion. The standard colour for firesleeve is red-oxide, but custom colours are available and black firesleeve with velcro is available in sizes up to 1.75" ID. Firesleeve is normally supplied in 100 foot lengths, but custom lengths of up to 500 feet are also available. Long lengths are common for marine firesleeve installations. We take our Firesleeve Fabric and add a hook and loop to result in a sleeve that can be easily installed on long hose or cable runs, or on hose and cables that cannot be detatched from their installation. This retrofittable solution allows the sleeve to be added, or replaced conveniently. This makes for an easy to use EAF (Electric Arc Furnace) cable cover. The smallest standard Inside Diameter (I.D.) is 1" and the largest standard I.D. is 12". Larget I.D.s are possible by fabricating multiple fabric widths together, with an almost limitless I.D. size being the result. We use 3/4" wide hook and loop on I.D.s from 1 " through 3 3/4"; and 2" wide hook and loop on 4 through 12" I.D. fabrications. Used in many applications; industrial, marine and aerospace. High Temperature Silicone Rubber Coated Fiberglass Sleeve with Velcro Withstands 500°F/260°C continuous exposure; Molten Splash at 2200°F/1205°C for periods up to 15 minutes and short excursions to 3000°F/1650°C. Molten metals simply slide off of the extra heavy duty coating of High-Temperature Silicone Rubber on all of these firesleeve products, providing excellent burn-through protection.